Luke Parker was prominent for the Swans in an even team performance, totalling 26 disposals at 73 per cent efficiency, 11 contested possessions, six inside 50s, five clearances and two goals. Stephen Coniglio rounded out a solid preseason after an injury interrupted 2017, finishing with 27 disposals at 93 per cent efficiency, five inside 50s and four clearances after finishing with 28 disposals last week against Collingwood. Sydney has enjoyed an advantage in the free kick count of 26 to 11. Thirteen of Sydney's free kicks have been for high contact. Lance Franklin has had 19 disposals for the match, all kicks, and has kicked 2.2.14 for the match. With Darcy Cameron and Dean Towers both on the interchange bench, Dan Robinson contested the last centre bounce for Sydney. Robinson is 184cm tall, compared to his opponent Dawson Simpson who is 210cm tall. Lachie Whitfield continues to relish his new role off halfback. The former No.1 draft pick has amassed 26 disposals at 85 per cent efficiency, a match-high 401 metres gained and has kicked a goal. Callum Mills has won the ball back from the GWS on eight occasions for his team, a matchhigh. Lachie Whitfield and Nick Haynes have six intercept possessions apiece for the Giants. 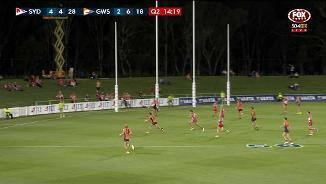 The Giants have hit the lead for the first time in the match through a goal to Jonathon Patton. GWS leads clearances 25 to 17 at threequarter time, but Sydney has outscored the Giants 4.1.25 to 3.3.21 from this score source. 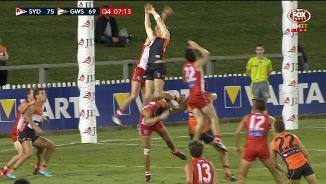 The Swans lead centre clearances 10 to eight and have outscored the Giants 3.0.18 to 1.0.6 from these clearances. GWS have hit back in recent minutes, kicking the last three goals of the match. They are winning the contested possession count by nine this quarter, led by captain Callan Ward and draftee Zac GilesLangdon who have five apiece for the term. Sydney are cashing in on their territorial dominance, kicking 3.4.22 to 0.1.1 as a result of a 12 to two advantage in inside 50s. The Swans have enjoyed three more minutes time in possession this quarter and have enjoyed 75 per cent time in forward half. Sydney has 10 of the 12 inside 50s for the quarter and have enjoyed 70 per cent time in forward half this term. Only three of Sydney's 26 kicks this quarter have been ineffective, a kicking efficiency of 88 per cent. Sydney have used the ball beautifully to start the third quarter. They have a kicking efficiency thus far of 89 per cent and a disposal efficiency of 94 per cent. The Giants are going at 64 per cent and 71 per cent respectively. Two centre bounce clearances to start the second half to Sydney. Two goals to Sam Reid as a result. Sydney gets the first goal from the very first centre clearance of the second half. Sydney has two goals from stoppage chains tonight, both centre bounce clearances. In his new role off halfback, Lachie Whitfield helped drag GWS back in to the contest. He totalled eight disposals for the second term at 100 per cent disposal efficiency, a team-high 155 meters gained and kicked a classy goal. The Giants lead inside 50s 12 to five for the quarter, have enjoyed 63 per cent time in forward half and have had almost two minutes more time in possession for the quarter, yet have only outscored the Swans 2.3.15 to 1.1.7 for the term. 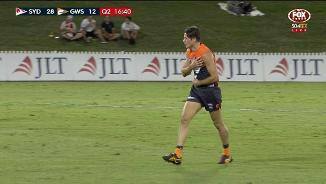 GWS scores through Harry Himmelberg as a result of a strong tackle inside forward 50 laid by Jeremy Cameron. This tackle was the Giants' first tackle inside forward 50 for the match. In a similar story to the early stages of the first term, GWS have dominated the inside 50s eight to four for the quarter, but the Swans have only been outscored by a point for the quarter. Both teams have been put under pressure with ball in hand to start the second term. GWS is kicking at an efficiency of just 54 per cent, while the Swans are going at only 43 per cent by foot for the term. Luke Parker had an excellent opening term with 10 disposals, four contested possessions, two clearances and a goal. Stephen Coniglio led for the Giants with 10 disposals at 90 per cent efficiency. Two of Sydney's four goals have come from chains launched from its defensive 50. Last season they averaged just 13 points per game from defensive 50 chains, ranked 13th in the competition. While the tackle count is just 14 to 11 in Sydney's favour, the Swans have recorded nine tackles inside its forward 50 to the Giants' zero. Just like that, the Swans kick four goals clear. They have owned the football, amassing 25 more disposals and have been far cleaner, recording a disposal efficiency of 77 per cent compared to the Giants' 70 per cent. Sydney is making the most of its forward 50 entries, with four scoring shots (2.2.14) resulting from five inside 50s. The Giants have nine inside 50s thus far, for just two scoring shots (0.2.2). Sydney is employing a short kicking game plan thus far with 19 of its 24 effective kicks being short. The opening goal of the game goes Sydney's way to Luke Parker. He has started well with five disposals at 80 per cent efficiency. Both teams are defending well to start the game with one behind scored by each team. Contested possession is level at 11 apiece in another sign that this is an even contest to begin with. Sydney averaged 13 contested marks per game last season, ranked second in the competition. Of these 13 contested marks per game, four of them were inside 50 on average, also ranked second. GWS played on from a mark just 26 per cent of the time last season, ranked last in the competition. The Swans were only ranked 15th in this area themselves, playing on from a mark 28 per cent of the time. 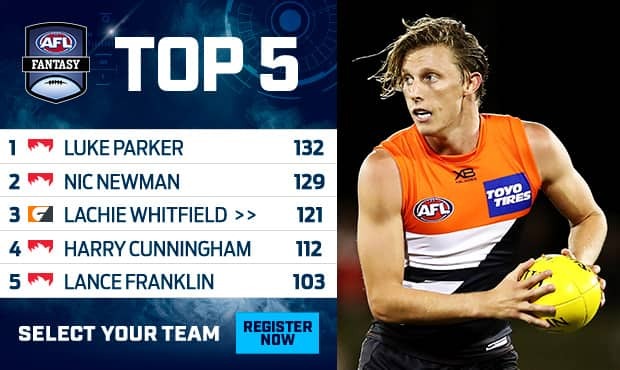 GWS ranked second last season for long kicks, averaging 59 per game. 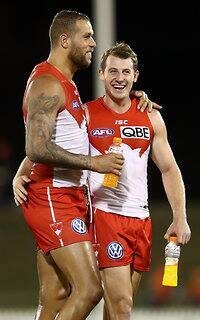 The Swans also frequently kicked long, averaging 58 long kicks per game, ranked third. Last season, the GWS Giants average 42 clearances per game, ranked No.1 in the competition. They averaged 34 points per game from stoppage chains, ranked fifth in the AFL. SYDNEY and cross-town rival Greater Western Sydney have warmed up for the home and away season with a spirited JLT Community Series clash at Blacktown, with the Swans winning the derby by 11 points on Friday. Dual club champion Luke Parker was a stand-out for the Swans with 26 disposals, 11 marks and two goals, while Jake Lloyd, Nic Newman and Callum Mills provided enormous drive from the back 50. Superstar forward Lance Franklin had another absorbing duel with GWS co-captain Phil Davis, the Swan finishing with 19 kicks and eight marks, and booting the last two goals of the match to seal the result. Lachie Whitfield was outstanding again for the Giants, controlling the play from half back and gathering a game-high 29 possessions, while star midfielders Josh Kelly, Callan Ward and Stephen Coniglio found plenty of the footy, and Jeremy Cameron kicked three goals. The Swans kicked the first four goals of the game to be in complete control and didn't surrender the lead until Jonathon Patton nailed a tough set shot early in the last quarter, but the experience of Parker and Franklin helped them over the line against the inaccurate Giants. In further good news for the Swans, Zak Jones (knee) made a steady return in his first game of the year through the midfield, while defender Heath Grundy (calf) also played his first minutes in the NEAFL curtain-raiser. "Heath played 60-odd minutes and pulled up well and 'Jonesy' played about the same amount of time in the seniors, if not more, and got through well," coach John Longmire said post-match. "Along with playing a really good brand of footy at times, those are the sorts of things you need to get out of games at this time of year." 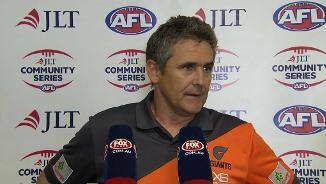 For GWS, star forward Toby Greene (toe) and veteran Brett Deledio (achilles) also got through the game without having a major influence on the result. Deledio gathered just one kick from eight possessions playing as a half-forward, but Giants coach Leon Cameron backed him to continue to improve as he gets more training into his body. "No doubt he was a little bit rusty early, but I think it's a huge relief that after a good 10-week block of running and training, that he got through unscathed. "We'll have some sort of hit-out and that will benefit him no doubt." Sydney: The No.1 ruck spot is up for grabs. After Sam Naismith went down with an ACL tear mid-week, youngster Darcy Cameron had his chance to press his claims with Callum Sinclair (ankle) missing, but while he showed some good signs, it wasn't the statement game he was after. 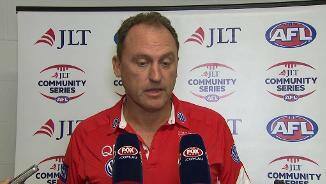 Sinclair should be fit for the Swans' trip to Perth in two weeks, so coach John Longmire has some thinking to do. GWS: The Lachie Whitfield backline experiment is here to stay. The gun wingman has been thrown into defence to give the team some run and had another big night across half back. The former No.1 draft pick still has some work to do on the basics of one-on-one play inside 50, but he makes up for it with brilliant use of the footy by hand and foot. Sydney: South Australian Ryley Stoddart didn't find a lot of the footy, but when he did get his hands on it his decision-making was outstanding at times. 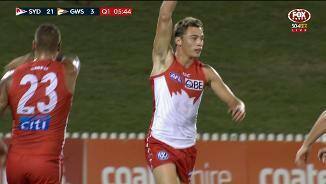 He's only lightly built but his speed and quality kicking skills are just what the Swans need. GWS: For the second week running Nick Shipley showed plenty of promise, with the western Sydney draftee impressive with his composure through the midfield. Young forward Zac Langdon was forced from the field with a shoulder injury in the second term but returned after half-time and continued to press his claims for a round one debut, while big man Lachie Keeffe was solid in defence in limited game time. 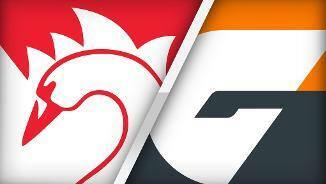 The Swans will be on the road when they head to Perth to take on West Coast, while the Giants have the next fortnight to prepare for their season opener against the Western Bulldogs in Canberra.